It is not often that I am willing to take a stand on something as broad and as complex as the aging process. For one thing, at age 63, I’m not quite ready to assert that I’ve even begun the process. Sure, a few aches and pains here and there, some titanium joint structures, wrinkly skin, graying hair….but those are not signs of age, just overuse and some genetic quirks. But old age is a different animal altogether, right? 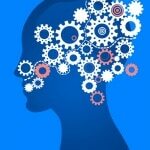 Old age comes with many features we often fail to acknowledge until something hits us right across the head. It often starts with small used-ta’s (you know, remember all those things you used to be able to do?) and minor adjustments to accommodate our aging selves. There are many things we can do to diminish the effects of time on our bodies, and even our minds, but ultimately time wins out. Until it does, though, we almost all pass through a phase we’d call ‘old age’, or ‘seniority’ or senescence. And the one common feature that pretty much says it all is a slower gait. Slower relative to our youth, and slower than those around us who are younger, even if we’re fit. 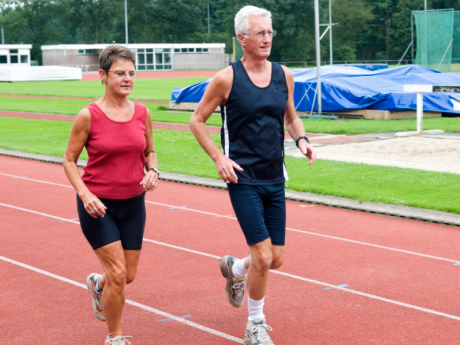 In the past couple of years, some research into this process of reduced walking or running speed has revealed much that trainers and trainees, and all who are aging, would be wise to consider. One study noted that older runners shorten their stride lengths even as they maintain their stride rates which combine to reduce their running speed. The failure of the ankle muscles – the calf, in particular – to push off as it once did was faulted. As to why, it was suggested that maybe they can’t handle the stress of running as you age. Another study looked at the changing sensory and motor functions of the lower leg – the ankles – and how these changes interfere with balance. The authors noted that about 90% of the body’s resistance to falling forward depended on passive ankle stiffness. Of course, as we get older, said stiffness – not flexibility but muscle and tendon toughness – declines making it harder to control our forward movement during gait. 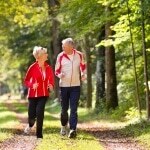 It therefore requires that the elderly pay more attention to their movement patterns. One way is to abbreviate one’s stride length. As you do so, you don’t push off as hard with your ankle muscles, they get weaker, and your stride gets shorter still. It’s long been the case that Achilles tendon injuries in athletes and non-athletes alike are more common after the age of 30. This is because the collagen that makes up the tendon, and makes it strong and supple, changes into the type that makes it strong…but not supple. Many a great athlete – Kobe Bryant, Shaq, and my friend, Scott – tore theirs while in shape, warmed up, and playing their usual games. All after 30. So what to do to stay young? Obviously, we can’t turn back the clock but we can exercise this small muscle group quite easily, and regularly, with two basic exercises. First, keep walking, and stride out intentionally; push off the balls of the feet with gusto. Second, hold a chair or wall and raise your heels as high as you can and then slowly return to the floor. Enhance the value of this move by standing with the balls of the feet on the edge of a step and allow the heels to go below the level of the step. Progress to doing this with one leg instead of two. Again, up fast, down slow. Much like the preferred aging process. From the Atkins diet to the Paleo diet and back again, the argument over how much protein to consume has been ongoing for over half a century, maybe longer. Here’s a quick review of its place in history to make the grand finale worth reading. For millions of years, hominids at all evolutionary levels consumed what they could find growing on bushes and trees or moving in water or on land. Even if it was no longer moving, humans would eat whatever they could get their hands and teeth on. So protein was a major part of our diets until we got skilled at agriculture; then we could produce our own foods so hunting and scavenging were less important. Many anthropologists contend that this alone contributed to the rise of societies and cultures. But protein, especially quality, animal-based protein, took a PR hit when, in the 1950s and 1960s, some in the medical community determined, or at least thought they determined, that the saturated fats found in animal products were detrimental to heart health. So grains, fruits and veggies ascended while animal protein, like eggs, red meats, and full fat dairy products, descended in the American diet. Dr. Bob Atkins, a cardiologist, bucked the trend and preached consuming a lot of meat and fat at the expense of grains and sugars back in 1963 to both lose weight and help the heart. After falling from grace as more evidence came out against such diets, various protein-rich diets hit the airwaves and bookstores trying to navigate the rising obesity levels and medical concerns along the way. Along the way we’ve seen the Zone diet of the 90s, the South Beach diet of the early 2000s, and the Paleo diet of the 2010s. All have promoted consuming more protein in order to lose and control excess weight gain while including some more fruits and veggies than Atkins did. Atkins himself even changed his model to include more options but kept the focus on protein in his later books. When I was in grad school, the American Dietetic Association was pitching a diet that was relatively low in protein and relatively high in carbs. Generally, we were told to consume about 10-12% of our calories as protein and about 55-70% as carbs with the rest being fats (25-30%). A more precise formulation was that we should get about 0.8 grams/kilogram, or 0.4 grams/pound of body weight of protein regardless of your lifestyle or gender. Thus, even athletes, it was said, needed no more than non-athletes. By the mid-1980s, more of the Soviet and Eastern European sports science literature was being translated. There they had found that athletes needed about 1.2-2.0 g/kg of protein. But the aging population hath wrought a new consideration for how much protein is needed. Since aging is accompanied by natural muscle loss, it is now felt that, not just for weight management but also for muscle function and disease resistance, people over 65 might be better off eating like athletes, getting about 1.2 g/kg/day. Since we can really only assimilate about 25-30 grams at a time, it might be best to do so in three or four meals, or even with supplements like protein bars or powders, throughout the day. 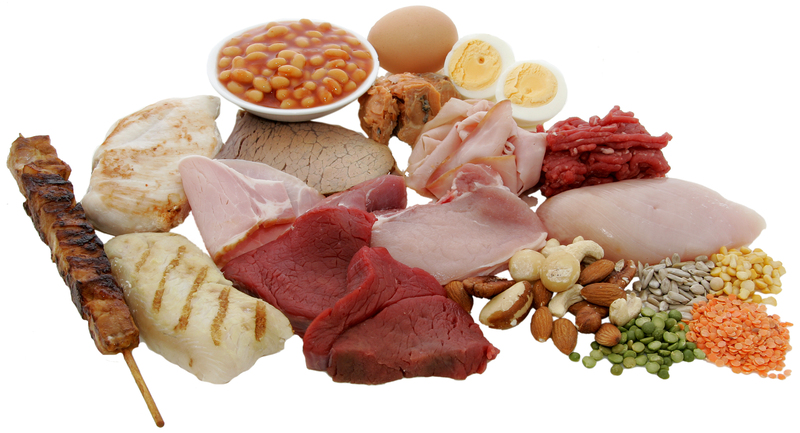 The benefits of protein intake are enhanced if consumed both before and after doing some strengthening exercises. This is called the ‘anabolic window’, and it works best within 30-60 minutes of a workout session. In other words, aging adults might now start considering themselves athletes in diet and in the gym. Most of us are aware that our bodies are made up of bone, blood, muscle and fat. And most of us are aware that having less fat relative to muscle is healthier and to some degree nicer looking. 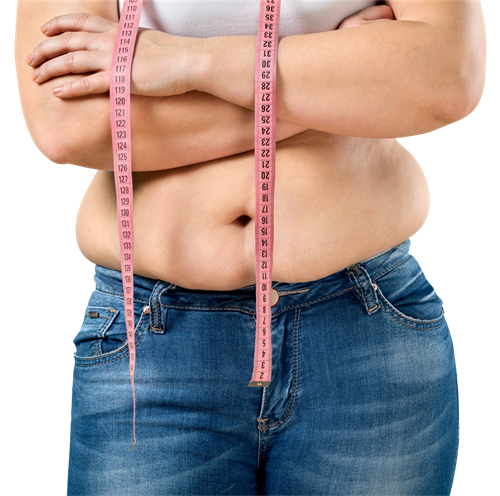 While our doctors and many studies assess the health of a patient or population by determining BMI – body mass index – via a simple formula that takes into account height and weight, most of us are aware that this is not the best indication of how fat we really are. Body fatness correlates well with many of the lifestyle diseases that are endemic in our society: heart disease, Type 2 diabetes, metabolic syndrome, and even some cancers. While there are genetic and gender influences on how much fat we store, the primary influence is lifestyle – that is, how much we eat and how little we move. But getting accurate measures of body composition, breaking it down to its primary components of fat and lean tissue, requires either pricey technologies or clinically-useful but less accurate techniques such as skinfold calipers. At the recent ACSM meeting in Boston, I learned of an affordable technology that uses ultrasound to both measure the fat that lies between the skin and the underlying muscle as well as to provide a visual picture of that fat a la an ultrasound for a medical purpose. So now STEPS can offer a non-invasive, no-pinching, modest-exposure method to calculate your body fat and composition, with comparative pictures (over time) of the fat layer in your abdomen. This 20-minute protocol can be scheduled by your trainer starting August 1. For a more accurate gauge of your body composition, with a report you can share with your physician, consider the IntelaMetrix Assessment. Calipers are so 20th century.